To get a better sense about an office, email the current and past office holders. Many of the past office holders have graduated. Please email the current Alumni Coordinator (Douglas Chin '21). Anyone can run for any office, with three exceptions: President, Drum Major, Head Manager, and Student Conductor must have been band members for at least one full year (sorry, freshmen). President: Responsible for communicating with the grown-ups of the world on behalf of the band (Princeton’s Administration, Athletics, Law Enforcement,etc). In charge of setting budget, schedule, the band t-shirt, and recruitment plan. Manages the officer corps and appoints Webmasters. Sends a lot of emails and takes care of the stands and chairs for rehearsal. Drum Major: Responsible for the creation and execution of field shows. Schedules all gigs, athletic and non-athletic, especially Reunions. Appoints Announcer. Also in charge of band intramurals. Dances like a fool in front of the band. Head Manager: Responsible for food, uniforms, lodging and transportation of the band. 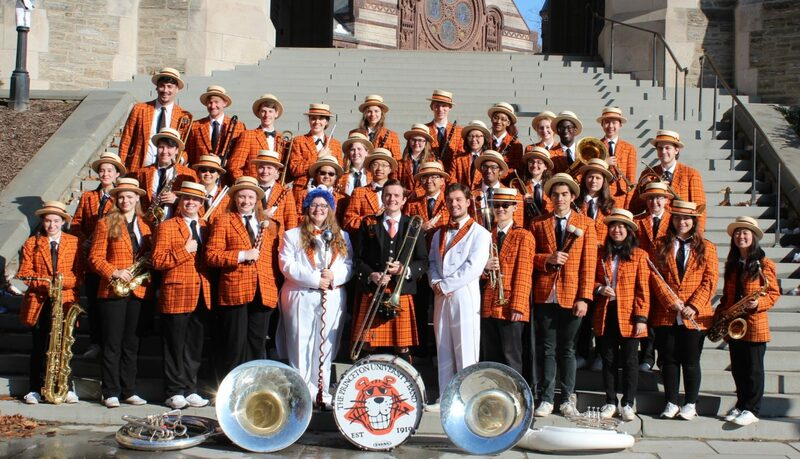 Communicates with other schools’ bands and coordinates hosting them. Treasurer: Sets budget and keeps track of band expenditures. Is in charge for the one weekend that the previous three officers are away. Conductor: Musical director of band. Runs rehearsals, manages the repertoire and waves arms around. Drill Master: Akin to section leader. Responsible for throwing parties, section bonding and sectionals. Manages purchase of instruments and supplies, as well as instrument upkeep. Makes sure the instruments are where they’re supposed to be. Takes attendance and sends out weekly SCHEDULE emails. There are 4 of them. Librarian: Manages music inventory and prepares sheet music for rehearsals. Gets yelled at and likes it. There are two of them. Alumni Coordinator: Updates blog and sends email updates to alumni. Coordinates them when they come to gigs. Assists other officers in their crazy projects. Manages the Band Reunions tent.